We can all use a little magic in our lives and the imagination can fuel some pretty magical moments. Picture books portray amazing fantasy worlds, providing inspiration for children to think imaginatively on their own. 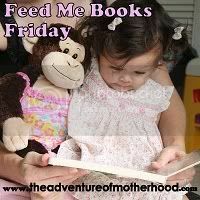 This week's Feed Me Books Friday theme at The Adventure of Motherhood is Books that encourage imagination. Link up your favorites there. Eva receives a very special box for her birthday. When she jumps into the box she turns into a master magician and, with the flick of her wand, throws a huge party with all sorts of wondrous guests and activities. 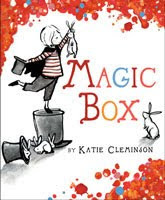 The illustrations by Cleminson are magical in their own way -- the book starts out with muted grays and blacks and then, as the magic begins, bright splotches of color appear all over the pages. The book makes a great birthday present and shows the power of imagination. A fabulous, magical blue hat appears one day and spins through the air, landing on the unsuspecting heads of various people in a town. The hat magically transforms each individual into an animal until a large wizard appears and performs his own special magic. 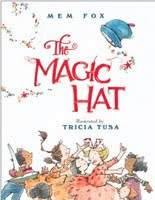 The kids love rocking back and forth repeating the rhyming, rollicking refrain, "Oh, the magic hat, the magic hat! It moved like this, it moved like that!" The fantastical, fun text is paired with whimsical watercolor illustrations by the amazing Tricia Tusa. If you've never witnessed her artistic magic, you must! 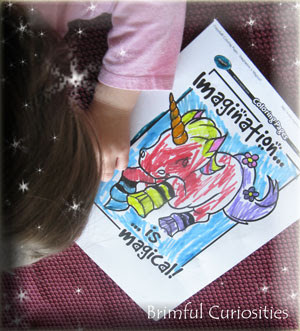 Here's a perfect coloring page by Crayola that captures today's theme, stating, "Imagination is Magical!" I am creating a list from today's posts because my little one needs more imagination. Thanks for these great ideas and for stopping by my blog. I have not seen these books before. They look wonderful! These look fantastic. thanks for sharing. Boxes seem to be a great spring board for imagination. We have several floating around the house right now acting as trains, ships, beds and the like. So cute to see. Great picks. I will have to check these out! Both of those look terrific! We have a few by Mem Fox in our home library, so I'm excited to learn of anotherone! Ooo! I love your theme of magic and imagination! I copied and pasted them both to my list. On a side note- I seem to always see your comments on the others blogs with relevant comments and I know they must appreciate that so much. Those books sound very interesting! The Magic Hat sounds lots of fun, I'll be on the lookout for it!